It would not be wrong to say that, a good website is like an identity for your business. When it comes to creating a website for the bars & clubs, then WordPress themes for bars on this blog is the apparent choice. In this article, we are bringing some of the best WordPress themes for bars that will make your website stand out. These themes are vibrant and by using them, your site will become the hot topic for bar talks. Moreover, you can showcase the ambience of your bar, liquor collection, create a fan base and share videos of your live music & dance shows, DJ’s, and banquet hall to organize private parties through your website. 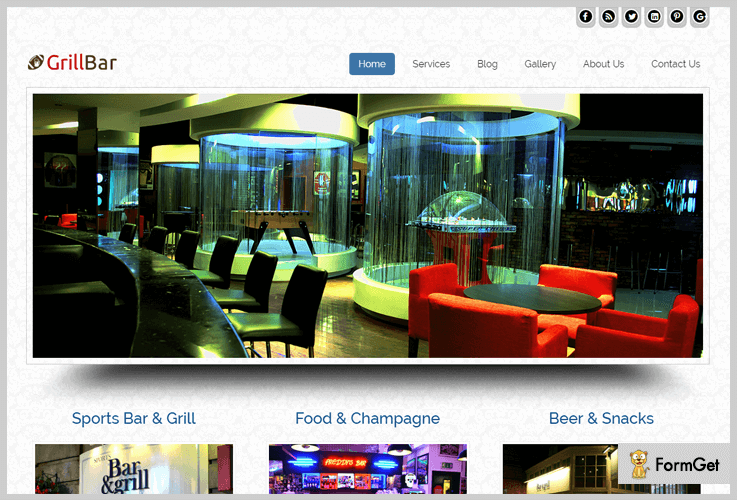 Furthermore, features of these WordPress themes for bars comes like the cherry on the cake. They include online booking and reservation systems, social media sharing features, responsive behaviour means suitable for all devices and many more. So, take a look at these themes and find out the best fit for your desire. 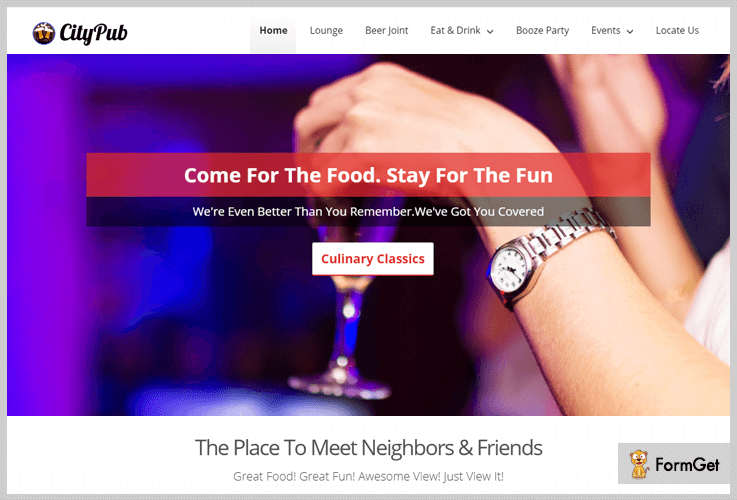 The CityPub theme is a WordPress template align to make bars, pubs and brewery websites. It comes with a responsive layout that can adapt all the screen sizes and is compatible with lots of browsers. 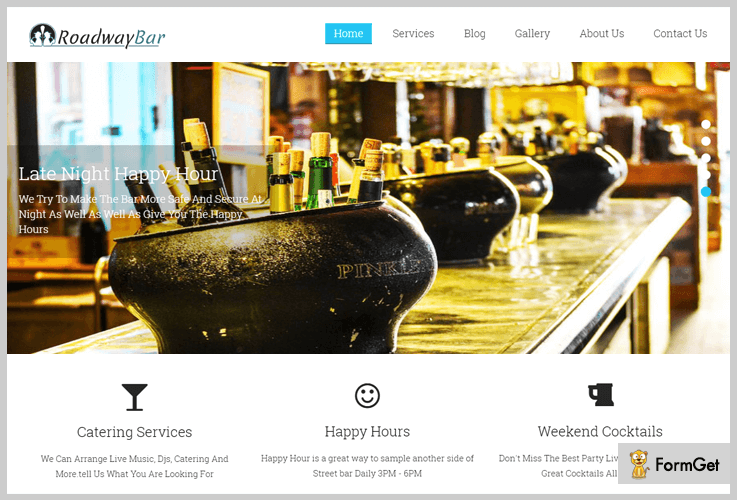 The WordPress theme for bars is primarily designed for the owner or manager of pub & bars. They fulfil their requirements by rolling out each & every facet, like their products, ambience, atmosphere, day to day activities and many more. This theme will become the best choice for you. And, its considerable features like the layered slider, 9 column gallery listings, easy setup etc which makes it more gorgeous. Let’s take a brief on the features. Get this multi-functional WordPress theme for bars now at just $79. CityPub WordPress theme has a separate gallery section. In which you can upload relevant images of your best collection of hard drinks like vodka, whiskey, rum, tequila, brandy etc. to grab the attention of your visitors. The theme has a testimonial section on the homepage. Which helps you to connect directly with your viewers and get feedback about your club. You can furnish more about your profession by using blog section. The theme provides a separate area to publish your related blogs. A full-width slider of 5 slides with short text description is here on the front page. The template has featured area with the flip display or with beautiful hover effects. Where you can create the number of feature attributes. 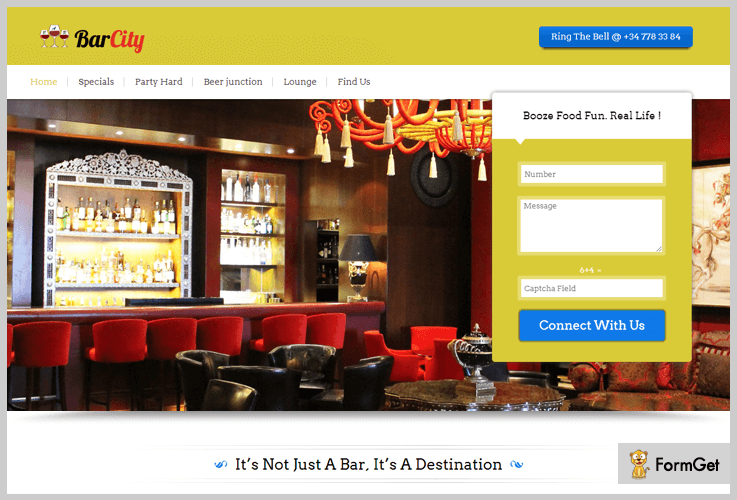 The BarCity is beautifully designed WordPress theme for bars, clubs and lifestyle websites. This theme has shipped numerous features like – you can showcase your events description, upload photos & embed videos in the separate segment, post your relevant articles and many more. It also includes some of the notable features like – beautiful slider, unlimited colours, parallax effects, social icons to connect with social media, responsive behaviour means it is compatible with all devices etc. You can select the plan for a single theme at just $79, and become a member at just $240 for a year and grab all our themes. The theme has a notable feature of lead capture form, means this segment can give the regular updates of your bar to the relevant customers. 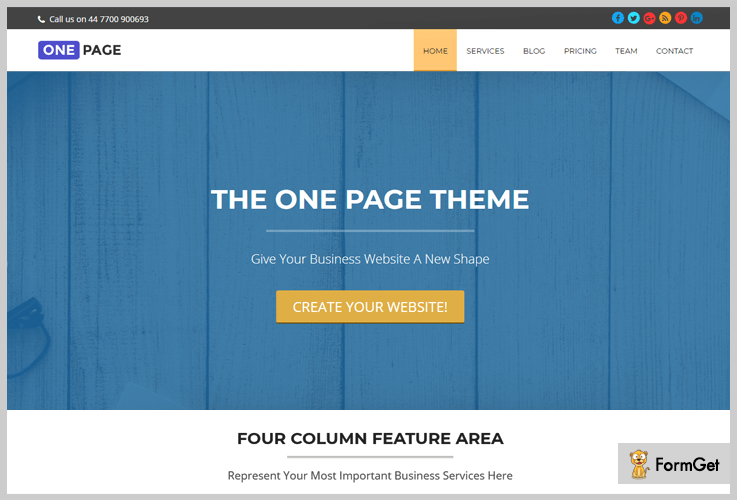 This template has 4 column feature area to showcase your business services online. Separate gallery section to roll out your images and photos. Widgetized footer area with customized features, you can put any of the widgets as per you. No need to go with programming side or back end. You can easily get installed this theme & setup to your system. RoadWayBar is a very stylish WordPress theme for bars, pubs, fashion and entertainment websites. This theme is fully customizable with the full-width slider, unlimited theme colours, animations & easy setup process. It comes with sections for photo gallery, event management, blogging and many more. This template helps you to showcase your bar events on your website so that you can grab the attention of online seekers. Inside you will find tons of options like page layout, custom widgets, menu panel, footer & header styles etc. You can select the plan for this multipurpose theme at just $79. This WordPress theme for bars has 3 column featured area. Here, you can summon your relevant services like events, catering skills, upcoming updates, ambience etc. The theme has separate blog segment where you can furnish more knowledge about your profession. Also, you can update your opinions about bars & pubs, that can help to increase traffic on your site. The theme provides a tagline area by which you can set a perfect punchline related to your business. Widgetized footer area of 4 featured columns that can elaborate your bar’s services. A contact page is here to interact with your customers, this page has a Google map feature to indicate your bar’s location. Sports bar and grill WordPress theme is a clean and modern WordPress theme for bars, restaurants, cafes, and pubs that will make your website stand out. This theme comes with a built-in events section to feature events on your website. And, also includes a section to affix videos and upload photos. Using these template you can manifest your services online like – interiors, catering organization etc. & notify about the latest updates of the bar. You can select this stunning theme at just $79. This theme is integrated with Ink-appointment pro plugin. This unique feature gives you the facility to schedule online appointments & orders from your customers. Even user can pay their bill online via PayPal. The column featured section where you can showcase your services and features. Also, in the same section, you can find a call to action button, which can be used to navigate your users to the desired page. The template has a testimonial section, so the visitors will get a glance at your working pattern. Separate blogging area to establish an interaction with visitors. Here, You can share your thoughts related to your business. The template comes in 9 different theme colours. The Traffica is a beautifully designed WordPress theme with tons of customization options like logos, intro text and many more. This theme comes with the sidebar having related information, also you can collapse the section. You can showcase your portfolio images and recent updates on a single page. This theme is more likely by the user, around 1000+ installation has been done till date. This template has 2 column feature area to showcase your services and features. The theme is translation ready in nature, means you can inherit your content in any language. You may find separate blog section to establish the direct interaction with users. 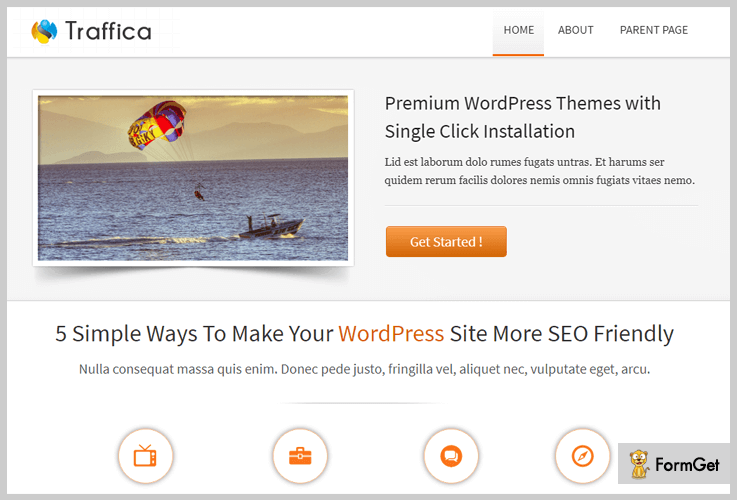 The traffica WordPress theme will provide the facility for quick installation & setup. One Page Theme is a single-page theme that showcases all the service and features of your website. You can easily get this beautiful theme in one click. Inside the theme there are tons of features like – slider area, different layouts, gallery section and many more, that is enough to make it more gorgeous. Furthermore, 4000+ installations have been done till date. In this article, we helped you to find the best WordPress themes for bars both paid and free versions. We hope that the information we provided here will definitely help you to summon the prime template & themes for your website. If there are things which are still not comprehensible so you can catechize through the comments section below.